Manufactured to EN-14183 and European GS standards. Wide base and 45° easy slope tread spacing. Sold without handrail - optional handrail sold separately. Strong , comfortable and stable in use. Choice of Steel mesh, rubber or ribbed aluminium treads. Wheels for mobility, and the optional handrail allows 'tilt and pull' movement. Over reaching for items that are high up can cause injuries which leads to absenteeism. It is vital that your employees have the right equipment on hand to prevent them from potential harm. 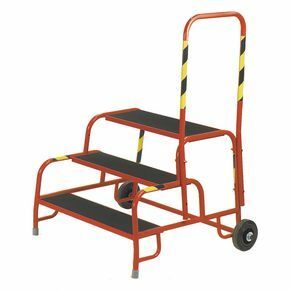 Our mobile buttress steps are ideal for reaching the top shelf on a tall bookcase, cupboard and mid-level shelves on a shelving unit in a warehouse. They are strong, comfortable and stable, offering great support to the user with or without the optional hand rail (sold separately). These mobile buttress steps are manufactured to EN-14183 and European GS standards, so you can trust that these are quality items. The wheels are for easy manoeuvrability and the optional handrail allows the user "tilt and pull" movement. They are available with a choice of 3, 4 or 5 treads, in blue, grey or red. There is also a choice of tread material to suit your workplace; aluminium, rubber or steel mesh. Our mobile buttress steps are a great addition to the workplace, reducing the chances of employees over stretching to reach items on shelves and they come with FREE UK Delivery.